December 2017 marks the end of scheduled 747 service for Delta Air Lines, and with the final aircraft in its fleet making a farewell tour, it’s appropriate to take a look back at how merger partner Northwest Airlines began service with this type back in 1970. Northwest Orient, as they were styling themselves, had placed orders for ten of the all-new Boeing 747-100 in 1966, not long after Pan Am had launched the type, and they started receiving their jets only a few months after Pan Am, as well. All ten were delivered in 1970-71, and Northwest topped up its order with five more 747-100B longer-range variants to be delivered in 1971. 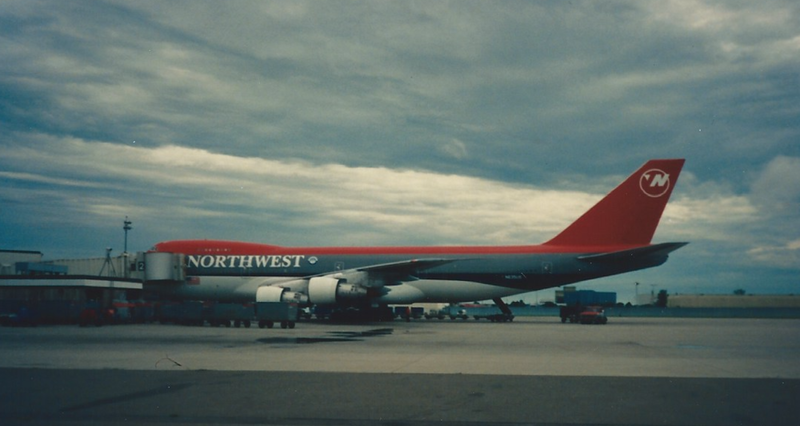 By 1980 Northwest had started to swap in the newer, more-capable 747-200 (as well as a handful of all-cargo models), and would later go on to be the launch customer for the extended 747-400. The -400s would pass on to Delta when the companies merged, but the remaining -200s were quickly disposed of, as well as the all-cargo subfleet. Northwest’s system map in Spring 1970 showed a mix of local-service flights across the upper Midwest and Mountain states, with trunkline services among many major Northeast and Great Lakes cities, plus new lines to Florida and California, and of course long-haul service across the Pacific. Minneapolis and Seattle were their main domestic bases, but they also had a significant presence at Chicago, and had even scored Chicago-Hawaii nonstop authority (in competition with United.) NWA was using several types of Boeing 707 and 727, and a dwindling number of Lockheed Electra prop-jets to fly the system. Northwest’s plan was to use the 747 to replace long-range 707s, giving them significantly more cargo and passenger capacity for revenue growth, as a “frequency-driven” model was not appropriate for the traffic demands of that era, not to mention less-capable air-traffic control and more-cramped airports. And by the late 1970s, 707s would be relegated to just flights from Tokyo to its Asian stations. From the collection of my good friend, Arthur Na. The 747-200s and even a couple -100s were painted in the"bowling shoe" livery, which remains my favorite. Delta has preserved one 747-400 at their big museum in Atlanta, and the forward fuselage of Northwest’s first 747, N601US, is on display at the Smithsonian National Air & Space museum in Washington, DC.